This year Teresa and I were invited to Winkler Manitoba to participate in the annual LTV Rally. We were excited to visit Winkler for many reasons. 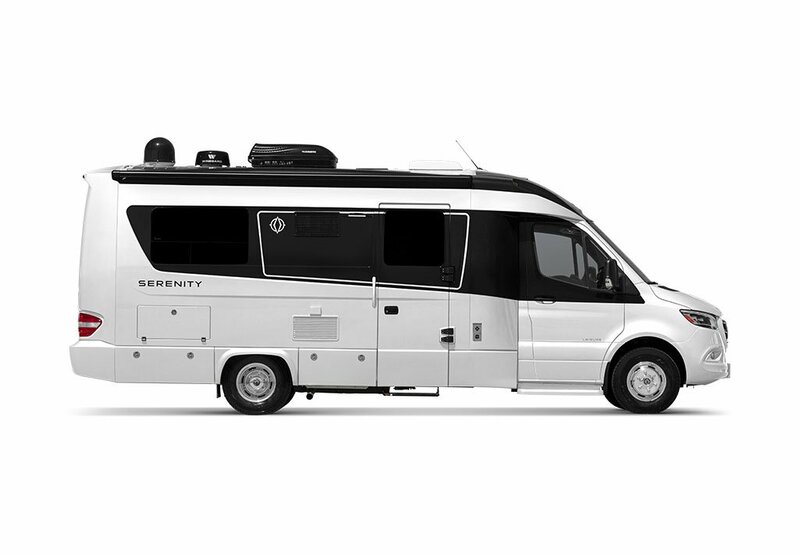 This would allow us to meet many fellow Leisure Travel Van owners, participate in presentations to help us learn more about our LTV, see many of the different models in person, and experience the factory tour and other events! We were also excited to make a travel adventure out of our journey to Canada and try out some ‘boondocking’. 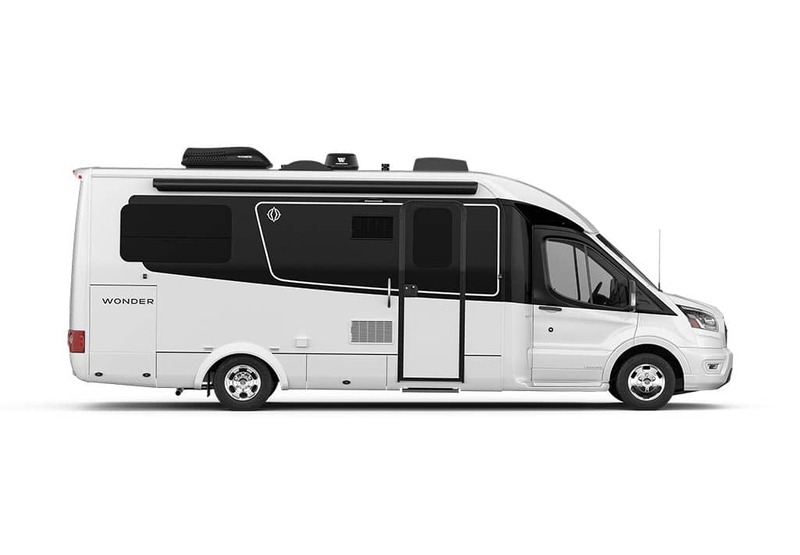 If you’re unfamiliar with the term boondocking, it can most likely mean different things to different people. To me, it means RV’ing or camping in the sense of an unplanned manner, off the main RV campsite grid with no hookups, and using the RV to its fullest survival capabilities. Some consider it ‘dry camping’, but in the true sense of the word, boondocking means staying in an undeveloped area. Our adventure to Canada would consist of leaving Colorado the Friday evening before the event, and arriving in Canada on Wednesday around noon. With basically five days to make the trip, we planned to break the approximately 1000 miles into shorter driving duration’s and make the most of each stop. Our first stop was planned to be only about a two and a half hour drive from home. This would at least allow us to get started and enjoy the first night in Pedro (the name we’ve affectionately given our Unity) as we headed north. 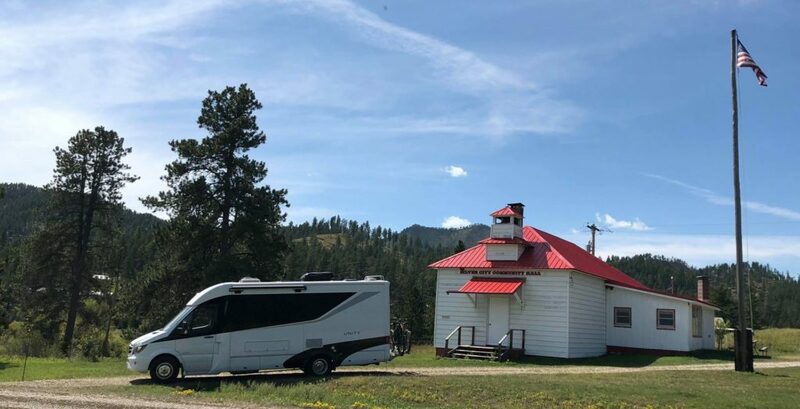 We had looked into some Wyoming state parks, but learned that Wyoming also requires a permit to use their state parks for overnight RV’ing. This was an expense we didn’t want to incur, especially since we’d only be in Wyoming a short period of time. 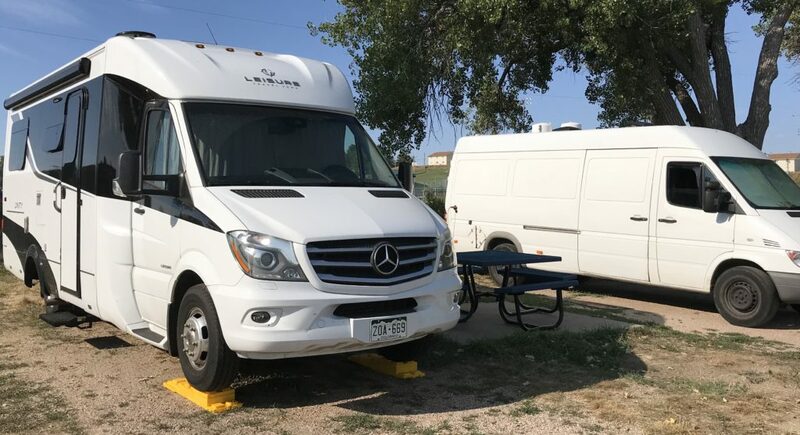 Using some RV apps on our phone, we identified Lewis City Park campground in Wheatland, Wyoming with some spots available on a first come basis. We decided to take a roll of the dice, if we make it great … if not we will look for another boondocking location. Luck was on our side that night! We made it to Wheatland just before dusk and found one of the last remaining spots with electric hookup. No water or sewer were available in the campsite, but we didn’t need any and the electric was an unplanned bonus. The city park was small, maybe six RV sites, and some tent camping. We immediately were greeted by two great horned owls across the way, so we spent some time watching them and talking to our new found friends at the adjoining site. The park did offer a central water spigot and dump-station, so the next morning we topped up our water before continuing our journey. Saturday consisted of a short trip further north, but not to find a camping spot but to find a spot to mountain bike. We ended up going just a short distance to Glendo State Park in Wyoming. The park was beautiful and offered a huge lake and many trails for hiking or biking. We didn’t plan to stay there that night, but put it on the list for potential future trips. The mountain biking here was great! It was a nice change from Colorado cycling also … we didn’t have to do much climbing! After our mountain biking excursion, we actually headed slightly back down south and eastward to Table Mountain Vineyards, a Harvest Host location we found using their app. This was our first time to stay at any Harvest Host locations. Though this stop was planned (you need to make a reservation with the winery), we knew we would not have any type of hook-ups for the night. On the way there, I noticed the sign to the Fort Laramie National Historical Site … and the detour was taken! I was expecting to see some old ruins that once resembled a fort but was totally surprised to learn that the fort was basically a small city. We ended up touring the entire fort which consisted of old resurrected buildings and some ruins as well. It was quite impressive and by the pictures dating back to the era, was actually more impressive in its heyday. There was a lot to see and read, and we didn’t’ have time to get it all in. After our two hour detour, we continued on to the winery but didn’t get there until past dark. We were able to find a level spot on the grounds right next to the vineyard. It was a very pleasant night … even the cats enjoyed peering out the windows. The next morning, we explored the winery and allowed one of our cats, Fletcher, to explore the vineyard with supervision of course. Around 9:30am, Patrick, one of the owners showed up. We did a ‘breakfast’ tasting of some of the wines they offered, bought a bottle and continued on the road headed north again. Today would take us through the west edge of Nebraska as we made our way into the Dakotas. What they say about Nebraska is true … corn as far as the eye can see! We entered South Dakota on the lower west side and made our way towards the Black Hills National Forest. 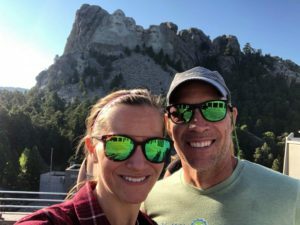 This was my first time travelling in South Dakota … and the Black Hills are amazing! We made our way into Custer State Park. Driving through the park offered many scenic views and locations designed for pulling right off the road. For a driving tour, this was the perfect setup … low-speed limits and plenty of opportunities for reading the roadside placards and taking in the magnificent views. Custer Park has some of the largest bison (Tatanka) herds in the United States. Within the one loop, we drove on we encountered a coyote stalking something in the tall grass, antelope meandering within about 30 yards of us, friendly burros that wanted to be rubbed and fed, and a very large herd of buffalo just off the road. Again, this would be a location to come back to. After our tour through the park in Pedro, we started to our next overnight spot, another Harvest Host location in Hill City. As we were driving we begin seeing signs for Mount Rushmore. I said to Teresa, “If we’re this close, we have to stop”! So, we made another unplanned stop at Mount Rushmore. As you can imagine, Mount Rushmore was incredible. I’ve always seen it in pictures but still amazing to experience firsthand. We didn’t have a lot of time to spend there, but we saw as much as we could in the short one hour time frame we had. Besides the incredible view, it also offers a very nice museum and some food areas. 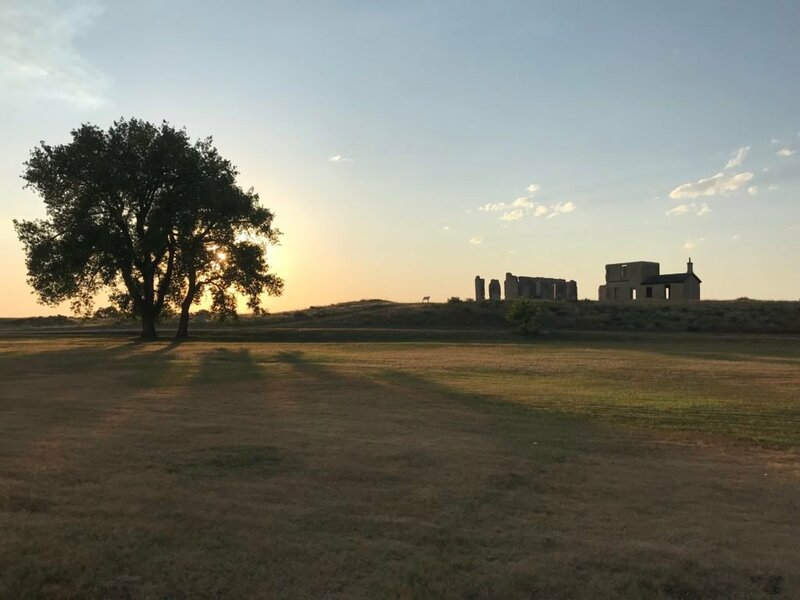 After leaving Mount Rushmore, we made a quick drive to our Harvest Host location, Naked Winery and Sick-N-Twisted Brewery, which would serve as our overnight spot. We made it there about an hour before closing and enjoyed some beers. Our RV spot for the night was just behind their facility alongside the river. I did manage to get a little fishing in that evening and the next morning before we started our trek again. We were still in the Black Hill National Forest area, so decided to get a little mountain biking and fishing in this day. Again we took a short trip northward and found a picnic area near Pactola Reservoir called Jenney Gulch. We used an app called ‘MTB Project‘ which shows mountain biking trails and difficulty levels. From Jenney Gulch we could access a portion of the Centennial trail which also served a dual purpose for me. It followed the river so I could also scout out where I wanted to fish. The trail started by wandering through a field with cows, but then put us on the side of the mountain with a shale base. At first I was a little concerned as my bike, with me on it, only wanted to slide down the shale mountain sideways every time I tried to stop. I quickly figured out the best way to not slide … don’t slow down! Luckily for us, that section was short. Once we got through that it was flat terrain again and non-technical making for a nice enjoyable ride. We did discover later, we could have easily by-passed the shale by staying on the road. 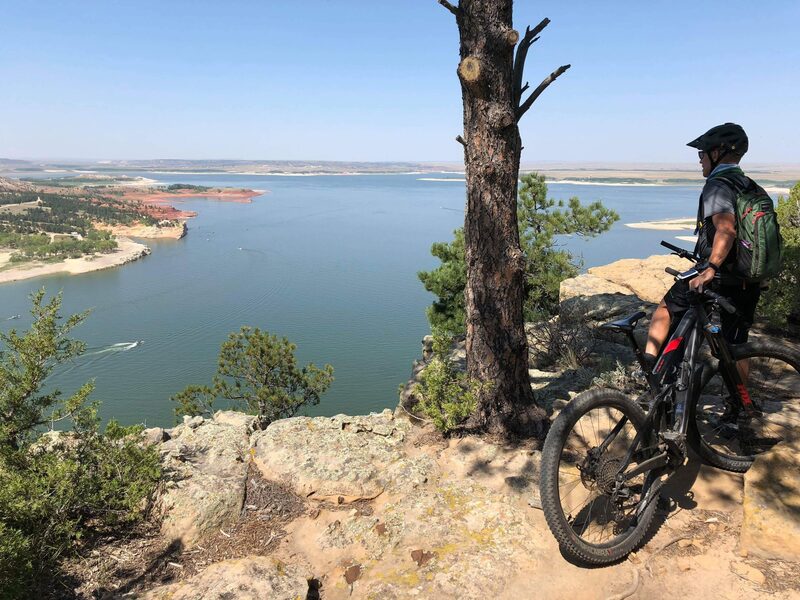 The trail takes you right past Silver City to the best part of the river. The trail following the river was flat single-track. The only thing I would caution anyone about is that you’ll have to cross some bridges and ride through some super high shrubbery/grass lining the trail. Other than that, it is very rideable. After about four miles in, it begin getting muddy and had a log river crossing about every 30 yards. At that point we turned and rode back to Pedro. We fixed a quick lunch and then moved Pedro to the trail-head nearest to Silver City. 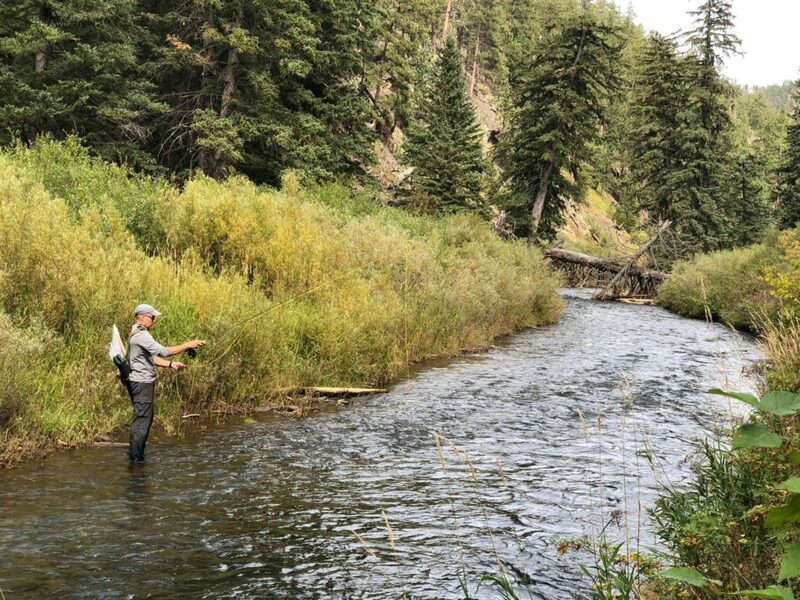 From here I grabbed my fly rod and rode up the trail again to the spots we had scouted out. To make the story short … I didn’t catch a single fish, but enjoyed the sound of the water and scenery while Teresa read her book on the river bank. On the way back out, we met a few fishermen that caught quite a few, and come to find out they all fished within about a mile of the entry … bad choice on my part I guess. Our plan was to make a pretty good trek further north that evening, but I liked the Black Hills so much, I just wanted to stay one more night. We ended up finding a spot within about two miles of the trail-head which had been completely full that morning, but now was nearly empty. We stayed at Whispering Pines RV park … it was only $38.00 for the night with full hookups. The spots are much like what we experienced at Winkler … gravel and grass. Harley and Lisa the owners were very welcoming. Even though the spots are fairly level, Harley even went so far as to provide leveling blocks for me, even though I have my own he insisted on having me use his to get us perfect. The park offered all the amenities, showers, laundry room, WiFi, full hookups and also has a little store on the property with a good selection of essentials. That night I grilled out steaks and we enjoyed some wine. I went into this day knowing I was facing a lot of windshield time. We wanted to get within about 2-3 hours of Winkler before Wednesday when the rally started. Spending the extra time in the Black Hills was totally worth it though! 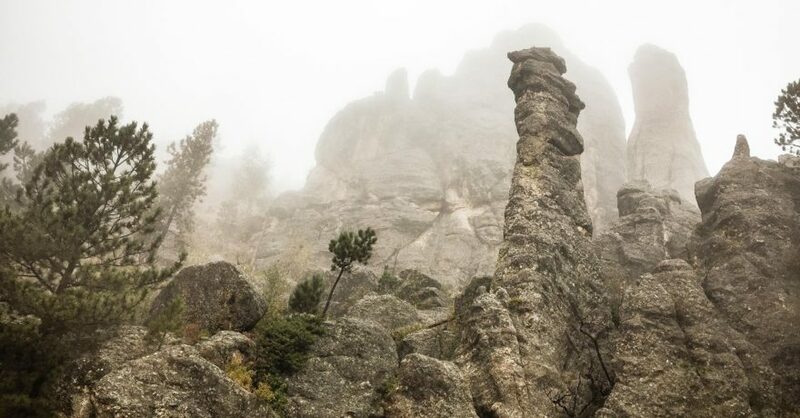 From here we headed through Deadman and Spearhead, South Dakota… again some areas we’d like to explore more after seeing them. We made our way across the southern North Dakota border … we were getting close, or so I thought. 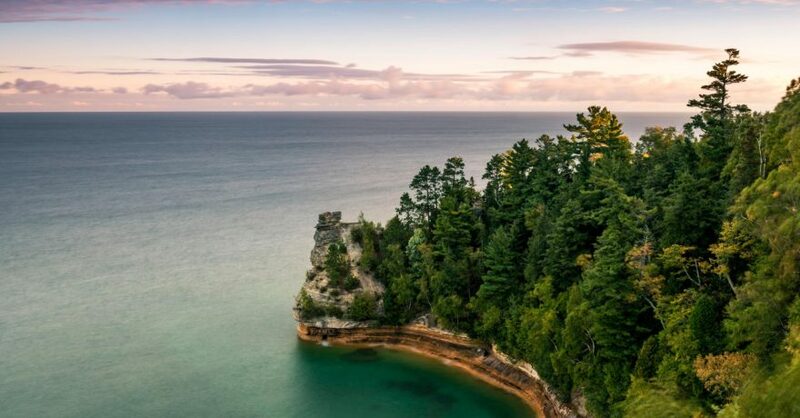 After much more driving we got on Hwy 85 which would connect us with Interstate 94 going east. Hwy 85 was a beating!! Beside the construction, it was THUMP… THUMP… THUMP… about every 30-5o yards. I couldn’t wait to get off this road and vowed to Teresa … “we are NOT coming back this way!”. Once on Interstate 94 we started making some good time. Teresa had planned for us to head to Fargo, North Dakota before heading north … my GPS was set! LUCKILY …. we pulled into a station to get fuel and noticed another Unity sitting on the back of the parking lot. The great thing about Leisure Travel Van owners is that when they see another LTV, they go meet the owners, and it’s a good thing we did! It’s almost like LTV owners are all from the same community … and wish to meet. It’s something I experienced at the Rally … we are all community … owners and employees. I say ‘luckily’ because after we met Terry and Mary Ann Barber whom were also headed to the rally, they informed us we didn’t need to go all the way to Fargo and we’d just be putting in extra miles. WHAT?? So, with that last bit of extremely useful information, my co-pilot Teresa started re-planning our route. 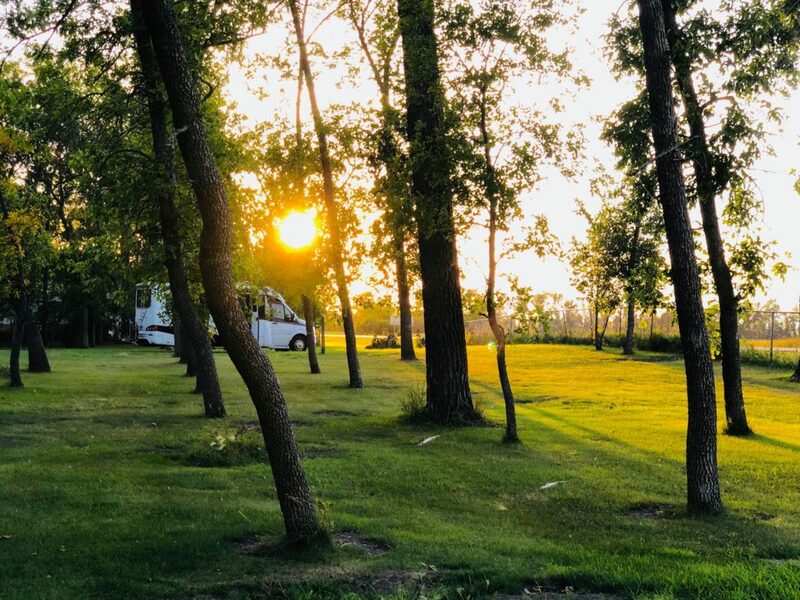 Using some various iPhone apps, she was able to locate a small city park in Glenfield, ND … with very little information about it besides that it was in town and offered RV parking. We entered Glenfield just towards the end of the day. We drove by the local bar, which was advertised to stay open till 2am, and that was pretty much the only business we saw in the 5 block town of 90 residents. We turned on another street and got lucky … there was the park! 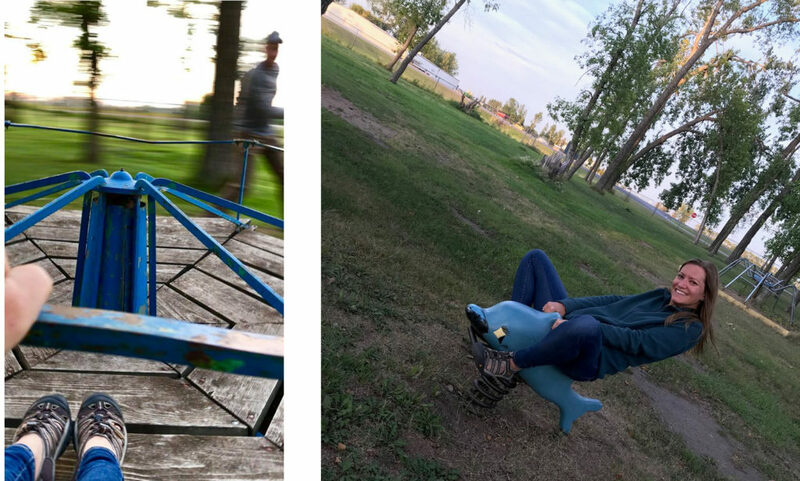 An old playground from the 1960’s with the type of equipment they now outlaw… and a row of trees lining a gravel drive through the middle of the park with playground equipment on one side and some scattered picnic tables on the other. I drove our Unity down the gravel path and at the end were two 4×4 wood post with 20 amp outlets. “This must be it!” I parked between the two post, took out my 20 to 30 amp adapter and plugged in … we had power! All was good. Teresa insisted I play on the playground equipment with her, though I made the wise choice to stay off the merry-go-round, but did regress on some of the other items. We did a quick dinner that night in the microwave thanks to the electric hookup and then prepared for the final leg. This day we headed north for a short drive to Winkler. This was our first experience taking Pedro across the border and we weren’t sure what to expect. We’d heard all sorts of stories … no fruit and vegetables, they would drill us on firearm questions, and more than likely want to look inside our vehicle. So that morning, we loaded up our stomachs on any fruits we still had … better to be digested than thrown away, we prepared our passports, and got the cat’s papers (shot records) ready to show. As it came to be, they barely asked us any questions, didn’t even ask about fruits and vegetables and didn’t search our vehicle. They didn’t even ask about the cats…. I guess the updated shots were good to get done regardless. We arrived in Winkler at around 10:30am and had just enough time to wash Pedro of all the road grime and bugs scattered about his entire body from the 1000 mile trek north and enjoy lunch … then the rally began! I could go on about the greatness of the rally, but that can be its own entire story. Teresa and I were new to RV'ing two years ago when we purchased our first RV. We both still work full-time, but were excited to join the LTV family and make some adventures on the road. Over the two years, we've learned a lot and experienced places and things we never dreamed of. We love our Unity and refer to it as 'Pedro'. We were so excited about this new phase in our lives, we've even taken on the opportunity of leading the Rocky Mountain Chapter. Some day... hopefully sooner than later, we hope to get on the road full time and travel. 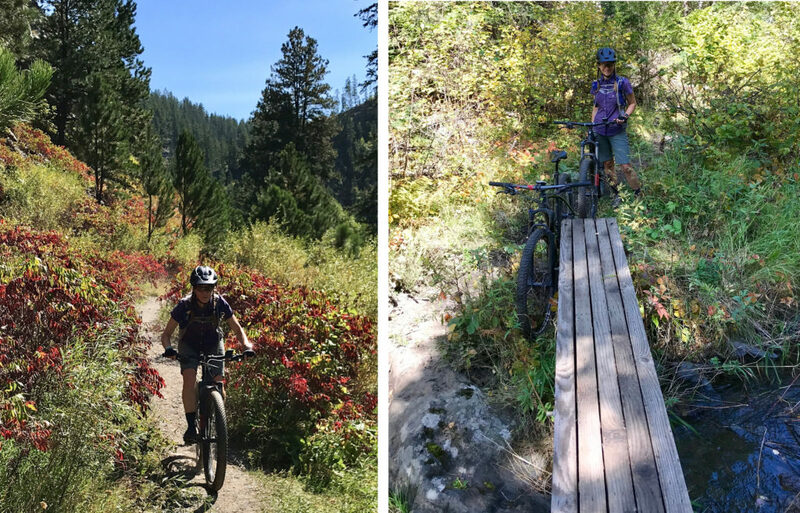 We're both very active with cycling and other outdoor activities and find RV'ing the perfect opportunity to make the most of making adventures and memories.